Escape traditional sedentary sitting and join the active sitting movement today. Active seating options include a variety of chairs, stools and seat that offer increased comfort, and deliver innumerable health and wellness benefits. The unique contours of active sitting furniture support the natural curvature of your spine, eliminate slouching, engage your core to prevent static sitting, and promote upright posture and an aligned spine so you can feel better and work better. Active seat stimulate dynamic motion so your back and abdominal muscles are continually working to maintain a high energy flow throughout your body, enhancing your concentration and creativity for the task at hand. Active seating furniture follows your body’s intuitive movement so you have an active body, alert mind, and happier back. 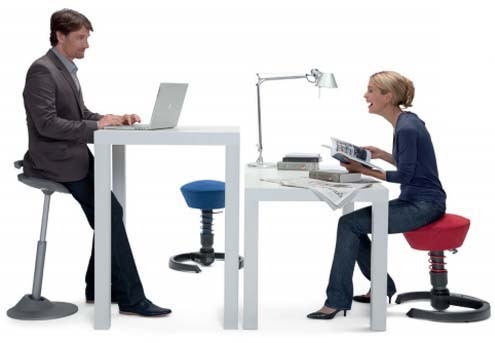 Incorporate active seat for standing/sitting with the height adjustable desk for a complete healthy and active work space. Both active seating and height adjustable desks promote mobility and constant motion throughout the day, so you don’t fall prey to poor posture and a sedentary lifestyle. Are you shopping for an active sitting chair, stool or seat in the Chicago area? Visit the Healthy Posture Store showroom located in Lincoln Square today! We specialize in ergonomic office furniture and our highly trained staff can assist in answering all your questions so you can shop with confidence. If you shop with us locally, you have the benefit of trying out products for yourself before purchasing, and the flexibility of exchanging products to find the right fit for you!